Mention the word “classic” and people think of works that are beautiful and enduring—Greek and Roman statues, Shakespearean sonnets, even luxury cars from a bygone era. 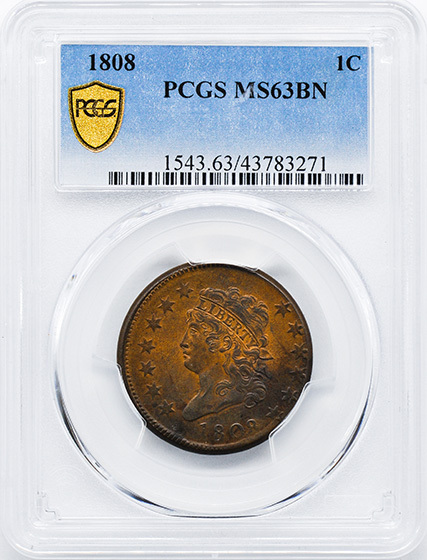 The so-called “Classic Head” large cent produced by the United States Mint in the early 1800s is old enough to be thought of in that context, but it’s not exactly “classic” in terms of beauty. On the contrary, its portraiture is plain—some might even say homely. And yet, while it may be misnamed, it is viewed with great affection by many collectors. 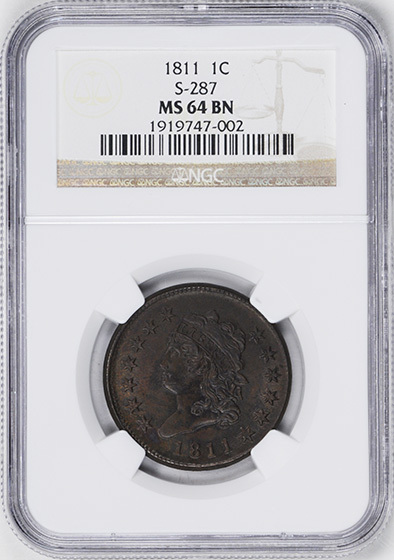 The large, copper cents issued by the Mint during the nation’s formative years underwent frequent changes in design. Four major changes occurred before cent coinage was even five years old, and lesser variations took place with regularity within these basic types. A semblance of stability seemed to have been established when the Draped Bust design introduced in 1796 not only lasted through the turn of the new century but actually completed 10 full years of production. But in 1806, a new director, Robert Patterson, took command at the Mint, and that signaled yet another shake-up for the coinage—including the cent. The U. S. coins being issued at that time all bore designs by the Mint’s chief engraver, Robert Scot: The silver and minor coins carried Draped Bust portraits of Miss Liberty, while Capped Bust likenesses appeared on the gold coins. Mint Director Patterson clearly wasn’t impressed, for in 1807 he commissioned new designs for each and every one of these coins. The handwriting was on the wall for Scot (and in the mail) when Patterson wrote to President Thomas Jefferson in March of 1807 suggesting that Scot’s “advancing age” (he was then 62) made his “good health” doubtful. On that basis, he sought authorization to hire John Reich, a talented young engraver, to serve as Scot’s assistant and redesign the coinage, arguing that “the beauty of our coins would be greatly improved by the assistance of his masterly hand.” Jefferson acceded, and on April 1 of that year, Patterson promoted Reich, then an unsung die-sinker at the Mint, to the post of second engraver. Reich has gained a wide following among collectors in the nearly two centuries since then. 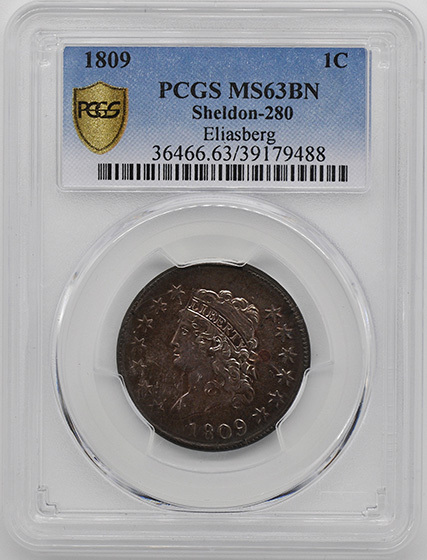 An organization of numismatists enamored of coins of the era bears his name. But his monetary reward was minimal at the time: He earned only $600 a year—not much more than the wages being paid to common laborers. Then again, the ill-used artist had little leverage: Escaping the Napoleonic Wars, he had come to the United States from his native Germany as an indentured servant. Reich’s assignment from Patterson was all-inclusive: He revamped every coin from the half cent through the half eagle, the lowest and highest denominations then being produced. His obverse design for the cent (and half cent) was a left-facing portrait of Liberty with curly hair, tied with a headband inscribed LIBERTY. Miss Liberty is surrounded by 13 stars, seven to the left and six to the right, with the date below her. The coin’s reverse carries the statement of value, ONE CENT, within a continuous wreath. This, in turn, is encircled by the inscription UNITED STATES OF AMERICA. The term “Classic Head” is credited to Ebenezer Locke Mason Jr., who proposed it in his hobby periodical, Mason’s Coin and Stamp Collector’s Magazine, in 1868. The “classical” connection is the fillet, or narrow headband, a device which dates back to ancient Greece. But the parallelism is flawed, for only young male athletes wore fillets in ancient times: They were prizes awarded to winners of local sporting competitions. Production of the new design began in 1808, with just over one million pieces struck. A cent shortage developed the following year, however, when the Mint ran out of planchets. Official records state that 222,867 cents were made in 1809, but research has uncovered that nearly 50,000 cents minted in June of 1809 may have been struck with leftover 1808 dies. Production returned to normal in 1810; in fact, that year’s output of 1,458,500 was the highpoint for the series. But a roller-coaster ride began in 1811 when mintage fell to 218,025, the series’ low point, rising sharply in 1812, then dropping again appreciably in 1813. 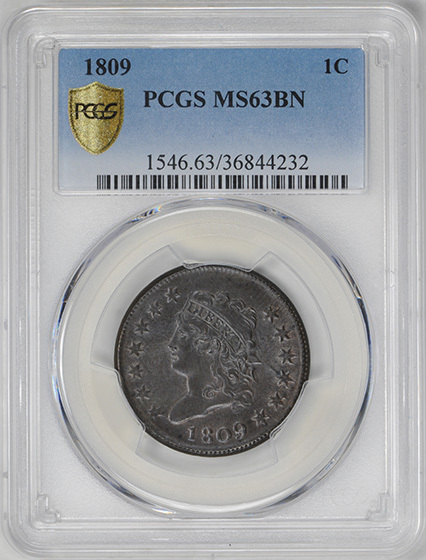 After a final low-mintage year in 1814, the abbreviated series came to an end. 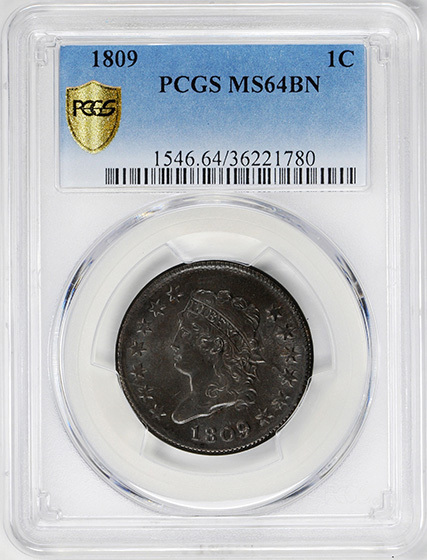 Short of planchets again in 1815, the Mint made no cents with that date—the only year missing from U.S. cent coinage from 1793 to the present. In 1816, when production resumed, the cent bore Robert Scot’s new and undistinguished “Matron Head” design. Combined total mintage for the series’ seven dates is just 4,757,722—all from the Philadelphia Mint. There are no great rarities in the series, but no “common dates” either. The scarcest date is 1809, usually seen darkly colored and porous, a condition familiar to much of the series. Classic Head cents are widely collected by date; dedicated hobbyists often include the overdates and other varieties in their sets, as well. 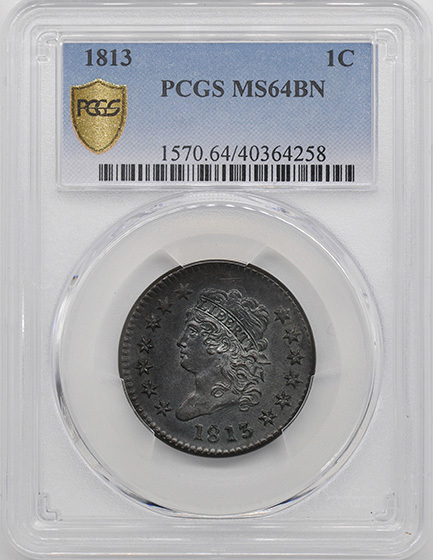 Type collectors pursue the more commonly found 1814 coins, with their generally sharper strikes and occasional touches of mint red. The Mint made no proofs, but some partially mint-red and prooflike examples of 1810 are known, discovered in a tiny hoard in the 1930s. Points to check for wear include the hair above Liberty’s eye and the leaves next to the O in ONE and the T in CENT.